People come to Tryon Creek State Natural Area (TCSNA) to enjoy nature’s beauty. They want to enjoy a natural and pristine environment, largely unspoiled by humankind. Our free-flowing Tryon Creek is an object of particular attraction. As beautiful as the creek can be, some visitors are alarmed when they see “pollution” (often referred to as “yucky stuff”) in the creek. The truth of the matter is, that what might look like “pollution” in the creek is oftentimes the result of purely natural processes, not pollution at all. 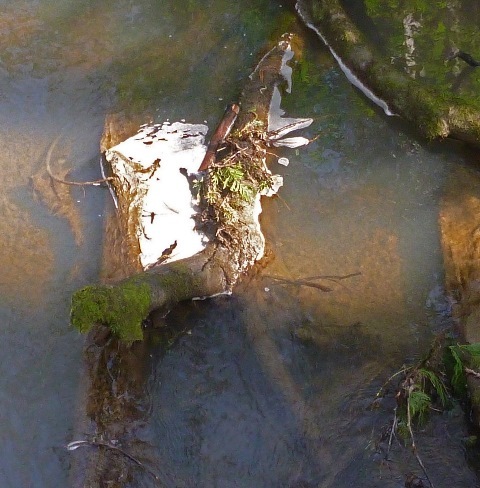 The two most common kinds of “yucky stuff” in the creek are white foam floating on the surface, and orange slime in the water. Once you understand these two kinds of “yucky stuff,” you can relax. So what’s with the white foam? You might think it’s soapsuds that leaked into the creek, but it’s probably not human-made at all. What really happened is a longer, but more interesting story. The edge of the creek is lined with all kinds of trees, especially red alder (Alnus rubra). Alders being alders, every fall dump huge numbers of leaves into the creek, as you can see in the photo below. And leaves being leaves, they start to decay, oftentimes in the stream itself. 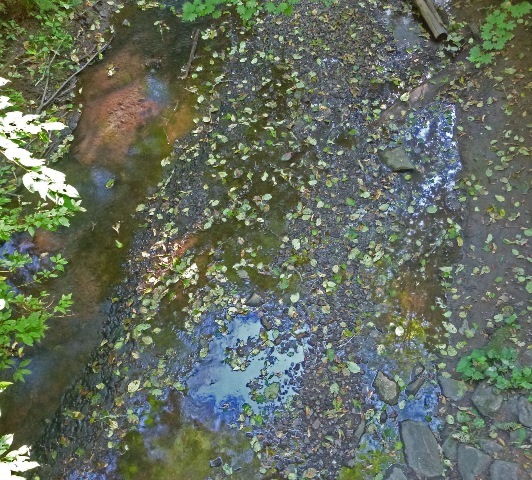 The photo below shows a large clump of mostly alder leaves (now brown) that have sunk to the bottom of Tryon Creek. Numerous microorganisms are decomposing these leaves. Note the tiny clumps of white foam floating on the surface above these leaves. So the leaves decay. Now what? As microorganisms decay the leaves, DOC (dissolved organic carbon) is released into the water. DOC is a totally natural mesh-mash of different chemicals. One of the DOC chemicals is palmitic acid, which is shown below. Palmitic acid is found in every red alder leaf. It is a major part of each cell’s membrane. Palmitic acid, or closely related chemicals, are found in every plant. Below is the chemical structure of a typical soap molecule manufactured by humans. The resemblance is unmistakable. There are two more carbons in the soap, but the major difference is highlighted in red in the diagrams. It is easy to see how the palmitic acid might act a lot like soap. Why do we get foam? Normally, the water molecules at the surface strongly attract each other, and form what is basically a weak shield on top of the water. We call this shield “surface tension.” Small insects called water striders can be seen walking on this surface tension on top of the creek in the summer. To see a demonstration of surface tension, please play the following video. Click on the Water strider to play the video! The DOC, just like soap, interferes with the natural bonding between water molecules in the surface tension layer. The end result of the soap or palmitic acid is that when air gets into the surface layers of the water, it isn’t squeezed out by the natural mutual attraction of the water molecules. Rather, the air enters the water and with a bit of agitation creates bubbly foam. To demonstrate natural foam-making, I used a jar of Douglas-fir (Pseudotsuga menziesii) cones that had been sitting on my home office desk soaking in water for about two months. [Note: If you happen to see my wife at TCSNA, please casually mention that you also have a jar of Douglas-fir cones soaking on your home office desk. It will help me a lot!] 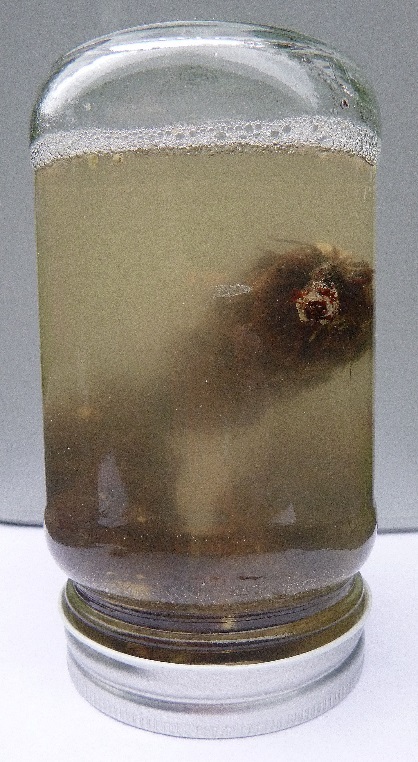 I used this jar to demonstrate that you can create foam just from decaying vegetation. All you need is some agitation, like what you might get from “rapids” in the creek. 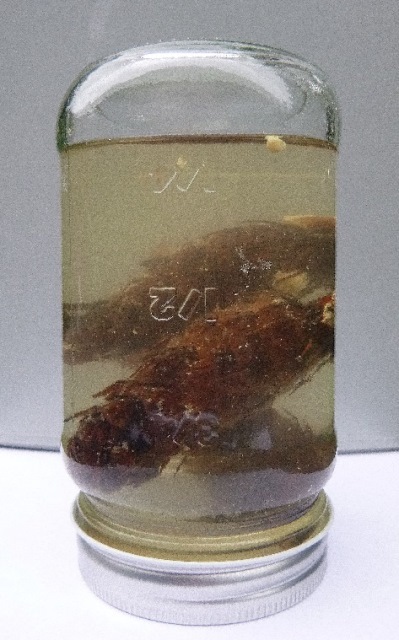 Photos of this jar at various stages appear below. Note how much foam is floating on top of the water. Soaked cones in jar before shaking – no foam. Cone jar right after shaking – lots of floating foam. Cone jar 90 minutes after shaking – still some foam. The foam persisted for a long time after the shaking. If this foam were produced in the creek, in 90 minutes it could travel a long way downstream. So we’ve got white foam in the creek, what else? The second type of “yucky stuff” we have in the creek is orange slime! This can be found in a couple of places at certain times of the year. I’ve seen some in the vicinity of Obie’s and Beaver Bridges. How this comes about is one of the most interesting and unexpected nature stories at TCSNA. The photo below shows a pool of orange slime in the creek. 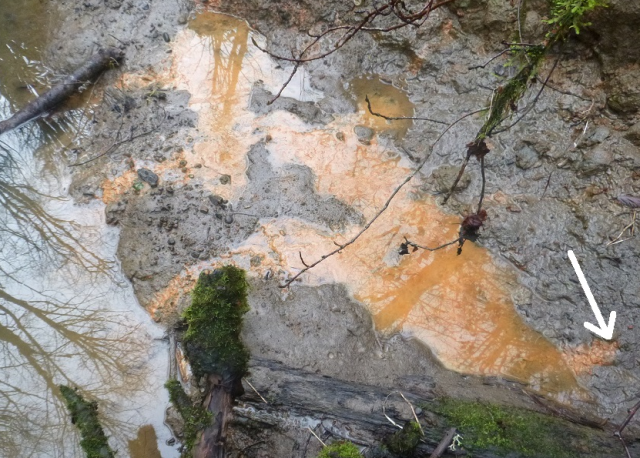 Some “orange slime” in Tryon Creek. Following this explanation, we see that the energy of the sun is the basis for all organisms. So far, so good, and if you are in 2nd grade, this is a decent way to start understanding life. However, the organism that makes the orange slime doesn’t fit into either of those categories. It’s weird! I love weird stuff! Tell me more! The weird organism is a special type of bacteria called “iron bacteria”. (I’ll skip lots of complex chemistry here! “You’re welcome!”) You and I eat carbohydrates like corn, donuts and potatoes, and oxidize it to get energy. In the process we give off carbon dioxide (each time we exhale) and water (through sweat, breath and urine). Iron bacteria don’t do that. These bacteria “eat” a special iron compound (ferrous iron, if you must know). Ferrous iron is found underground where there is a deficiency of oxygen. As water carries it up towards the surface of the ground it encounters both more oxygen, and the iron bacteria. The iron bacteria oxidizes (“eats” to put it crudely) the ferrous iron, and “poops” regular old rust (ferric iron, for you geeks). These iron bacteria are classified as “chemoautotrophs” meaning roughly, “they feed themselves with chemicals.” That’s right, the orange slime you see in the creek is essentially rust excreted by these special bacteria. In eating this special iron, the bacteria get the energy they need to live. 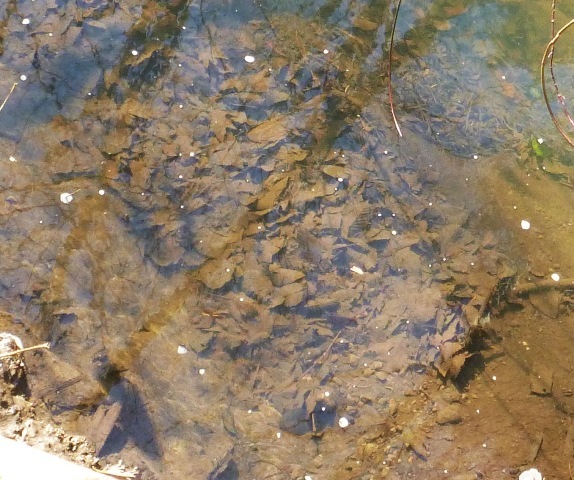 The photo below shows the ferric iron seeping out of the soil into the creek. 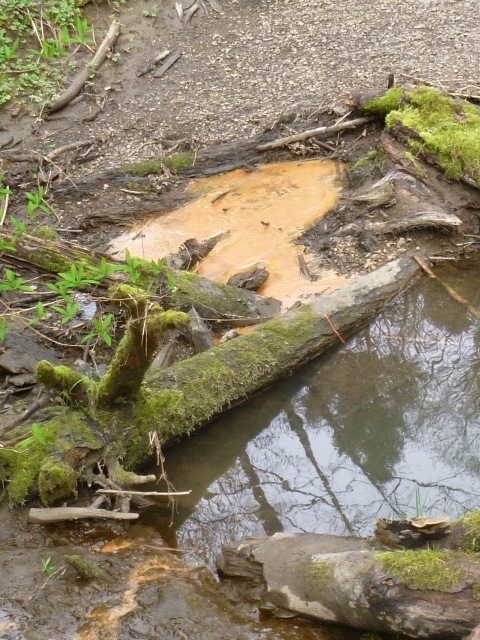 Iron oxide (“orange slime”) emerging from soil (at white arrow) and oozing into Tryon Creek. 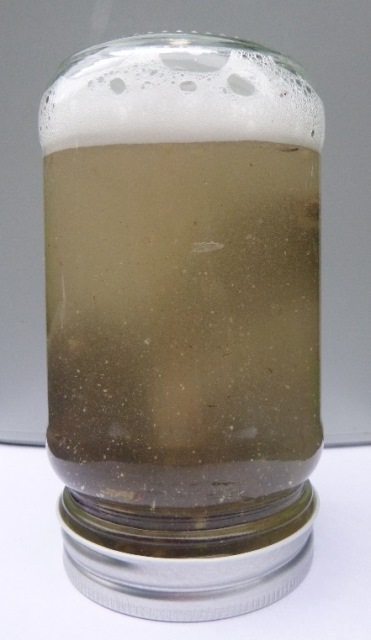 Given that TCSNA is just a few miles from an old iron mine, it’s not surprising that TCSNA’s soil contains the high levels of iron needed to support this kind of bacteria. Unlike what you may have been led to believe many years ago, these bacteria represent a group of organisms which don’t rely on energy from the sun to stay alive. If the sun ever goes away, no more plants, no more bugs, no more birds, and no more people. Then the iron bacteria will have TCSNA all to themselves. It probably won’t be a very exciting place, but there will still be life here! The next time you see some “yucky stuff” in the creek, pause for second before calling it pollution. You might just be seeing the end result of some very interesting natural processes. The floating white foam and orange slime are just as much a natural part of TCSNA as your favorite birds and flowers. They are another reminder that nature is endlessly fascinating.